If you made a resolution to eat better this year, adding more oats to your diet is a great way to start. You're probably aware that oats contain an incredible amount of soluble fiber, which lowers cholesterol. You may know that they're just full of important vitamins and minerals, including thiamin, folate, iron, magnesium, and zinc. But you might be surprised, as I was, to learn that oats have more protein than wheat and other common grains. Oats, which grow well in cold, moist climates, are beloved by citizens of many Northern countries, notably the Scots. Sitting down to a steamy bowl of hearty oatmeal, topped with cream, fruit, or syrup, on a chilly morning, it's easy to see the attraction. Oat grains are called groats, and they are processed in different ways to give different results. Steel-cut oats are simply groats that have been cut smaller to make them cook more quickly, while old-fashioned, quick, and instant oats are all made from groats that have been pressed between heavy rollers to flatten them into flakes—the thinner the flake, the more quickly it cooks. All forms of oats are the same nutritionally, but instant oats generally include sugar and flavorings, and the tiny pieces don't yield a very interesting texture—I avoid them. Recipes for baked goods generally call for old-fashioned or quick oats; old-fashioned oats, being thicker, will retain more texture. Oatmeal gives moisture and a wonderful flavor to breads, cakes, and, of course, cookies. While I can't claim that oatmeal cookies are health food, they have a satisfying nuttiness that makes them a favorite in my house, and I like to think that some of the benefits of oats accrue even in this butter- and sugar-laden form. So I developed a recipe for rolled cookies that include this delicious grain. With brown sugar and a hint of cinnamon, they taste a little like shortbread. Enjoy! 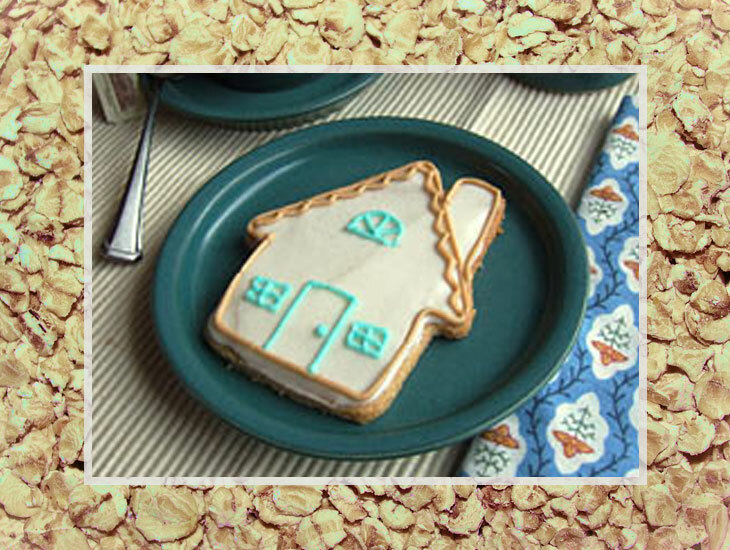 My favorite shapes for Oatmeal Cookies include the Gingerbread House cookie cutter, the Snowman cookie cutter, and the Horse cookie cutter.